US Gear division of AP Products would like to take this opportunity to introduce two new applications for the popular Unified Tow Brake product line. One of the key features to the UTB is that the system is capable of keeping the Power Brakes of the towed vehicle live while being towed. We achieve this by supplying a 12v vacuum pump in the kit for replenishing the vacuum reservoir for the vacuum assist power brakes. Today, automotive manufacturers are building a new breed of vehicles without vacuum power brakes but rather "Electric Hydro-boost" power brakes. Thus, a need for a UTB kit without the vacuum pump components. It is our belief and that of the Automotive Industry that we will continue to see a large growth of these towed vehicles being manufactured in the future. PORTABLE "BOX TYPE" TOW BRAKE SYSTEMS WILL NOT WORK! 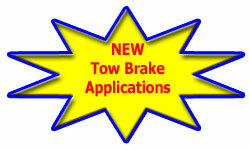 These new applications are now available from your dealer. Contact a dealer for more information. Note: Use of the TV-1000K and TVH-1000K kits with a factory pre-wired coach will require an additional 6-wire umbilical cord and a 7-pin to 6-pin adapter that is NOT supplied by U.S. Gear. These items are necessary to utilize the factory 7-pin connector on rear of coach. *Installation charges are determined by the installer. All prices and specifications are subject to change, without notice. Copyright © 2008 AP Products, Inc.